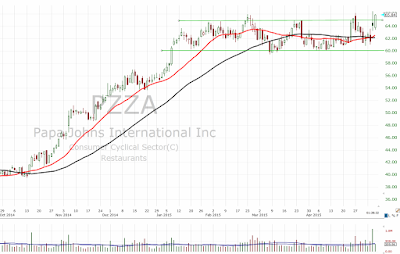 Papa Johns (PZZA) has been trading in a range for 5 months between $60-$65. 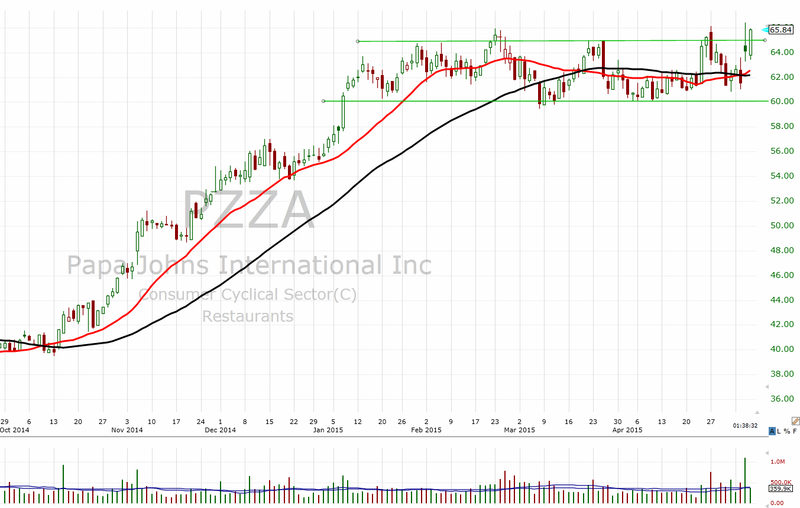 On the back of its earnings report (5/5/15) the stock is now exiting the top end of the base, this is now a fresh breakout. PAPA Johns reported first quarter earnings of $.55 cents compared to $.45 cents in 2014 an increase of 22.2%. First quarter revenues were $432.3 million, a 7.7% increase from the first quarter of 2014. They also increased their earnings per share guidance for 2015. From a technical perspective the measure move of the base is $5, this gives us an initial target of $70, a move below $65 will put this breakout on hold and move down to $63.26 negates the breakout.